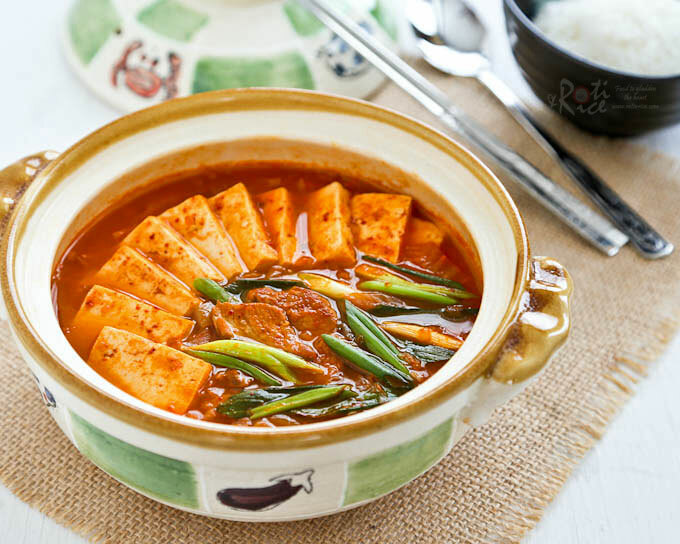 A popular spicy Korean stew made with fermented Napa cabbage kimchi, pork (or beef), and tofu. Quick and easy to prepare. Kimchi is one of those condiments you keep in the refrigerator and sometimes forget. This is especially so if you have a big jar of it. Fully fermented kimchi can be very pungent and tart. When that happens, do not throw it away. 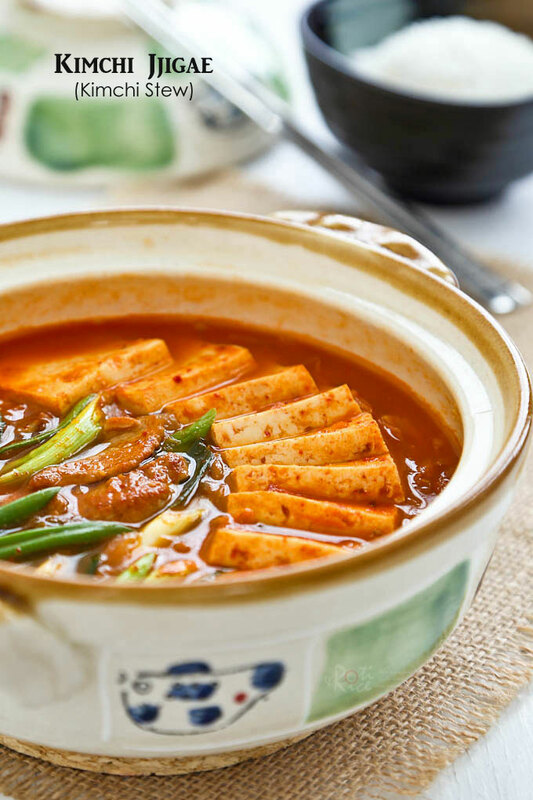 Kimchi Jjigae is a spicy Korean stew you can make using “old” kimchi. This tasty dish only needs a bowl of steamed rice to accompany it. Kimchi Jjigae may appear to be very spicy but it really is not. 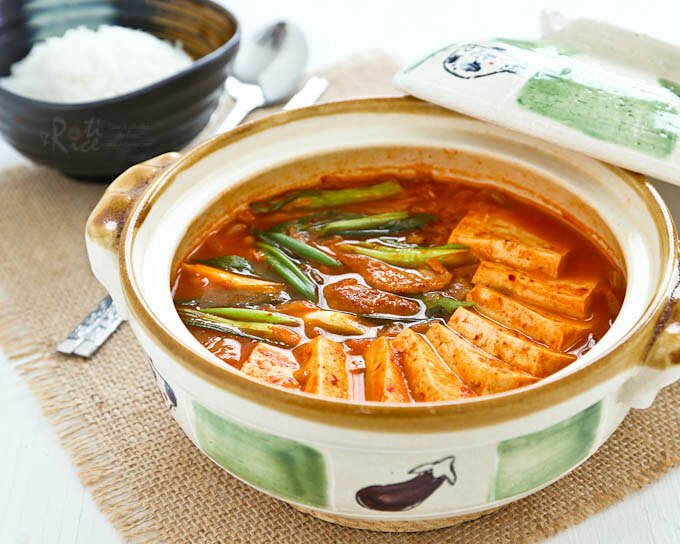 The kimchi‘s potency is greatly reduced once water is added to the stew. A little gochujang (hot chili paste) or gochugaru (hot pepper paste) may be added to bring the heat level back up. Omit this if you prefer it mild. Thin slices of pork belly are normally used in this dish but I prefer to use the leaner pork sirloin. Since there is not much fat in the pork sirloin, a little sesame oil is added for it to fry. Pork may be substituted with beef. 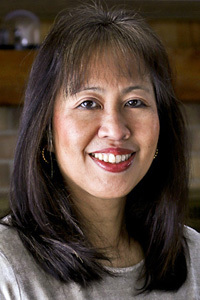 Please use firm or extra firm tofu so that it will not disintegrate in the stew during cooking. Heat sesame oil in a pot or stove-top casserole dish. Add pork and fry for 2 to 3 minutes. Then add onion and stir fry for another minute. Add garlic, gochujang, and napa cabbage kimchi. Continue to stir fry for 3 minutes. Pour in kimchi juice and 1½ cups (360ml) water. Bring to a boil, reduce heat, cover, and allow it to simmer for 15 minutes. Add sliced tofu and continue to cook for another 5 minutes. Turn off heat. Add sliced green onions. Kimchi Jjigae is one of my all time favs! It always hits the spot and great for one of those days when I don’t have much of an appetite. It kicks my appetite right back up. It’s great for eating after a stressful day too. The heat in the kimchi jjigae (I like to add Serrano or jalapenos for the extra kick) seems to relieve some stress, at least for me it does hehe. I made this last night and it was wonderful! I had some really fermented kimchi and this stew allowed me to use it. I love the spicy broth and the incorporation of pork and tofu. Thanks for the recipe!